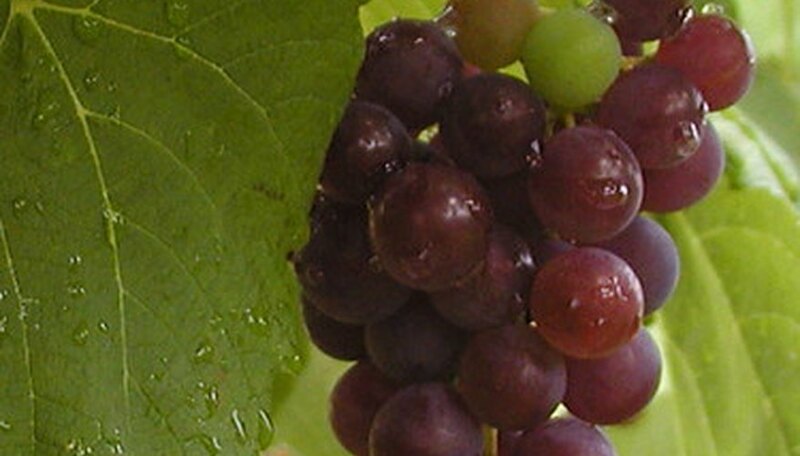 Grapes are among the oldest of cultivated plants. Archaeologists believe that the first attempts to cultivate wild grapes occurred approximately 6000 B.C. in Asia near present-day Georgia. By 5500 B.C., the practice of growing grapes had been brought to the Fertile Crescent. Today, more than 5,000 species of grapes are cultivated for wine all over the world. These varieties are called by more than 20,000 names. One way to identify grapes is by their leaves. Grape leaves play an important part in the development of grapes. As with all plants, the leaves of grape vines collect light to aid in photosynthesis. This photosynthesis is so important to their development that grape vines planted in shady areas seldom develop grapes. According to Michigan State University, grape vines with leaves that have been underdeveloped due to exposure to systemic weed killers such as 2, D-4 may not develop fruit. Grapes are culturally significant around the world. Religious tradition states that Noah planted the first farm when he grew grapes. Grapes were such a significant crop to both the Greeks and Romans that their god of agriculture, Dionysus, was also linked to grapes, wine and excess. Dionysus was frequently portrayed with grape leaves on his head. Because grapes are one of the oldest cultivated crops in the world, it is unsurprising that grape leaves are used in a number of cuisines springing from the Mediterranean area, including Arab, Turkish, Romanian and Greek. Grape leaves are usually stuffed with spices and meat or rice. They are frequently used as a wrapping in dolma, which are stuffed vegetables, or sarma, which are wrapped food items. Grape leaves grow on alternating sides of the grape vine. The edges of the leaves have a jagged, toothed appearance. Typically, grape leaves may have several shallow nodes. Grape leaves are generally green and have a woolly texture. Grape leaves have also been used for medicinal purposes. In the past, grape leaves were used as a poultice to stop bleeding and cure inflammation. Today, naturopathic doctors recommend grape leaf extract for inflammation, rashes, yeast infection, fever, circulatory disorders, diarrhea and as an antioxidant.